5 unit graphics of Landsknecht-Doppelsoldners wielding zweihander swords, rendered through Poser 6. The original Poser model is made by Kinboat, a Civilization 3 modder. All the Standing, Running/Walking and Attacking animations are in 8 directions! So, in order to ensure the animation shows up correctly in the game, please remember to set the 'Mirroring mode' value of these 3 SLP into 0 in your mod's .dat file. The Dying and Dead Body animation would remain in 5 direction though. New unit icons are also included in the RAR file. Feel free to use it in your mods, but don't forget to give Kinboat and me credits! Hey Ivenend, thank you for the good submission of your Landsknecht unit. I have removed your other submission of the some unit as we don't allow duplicate submissions at the Blacksmith. Please use the 'update' button next time, which you can find located in the blue bar just above your file description. Many thanks. Thanks! I would keep this rule in mind! The unit looks very historically accurate and the colors look fantastic. However the attack animation looks weak. Perhaps a horizontal slash might be better? This unit is a unit converted from a civi3 unit but the proportions are fixed to match AOK more and looks less like a civi 3 unit.It has both running and walking frames and icons are also included. Different variations adds more use to the game but the attack animation could use more work. Instructions are provided on how to get it in to the game but not easy to do unless you know how to edit the dat file. Additional Comments:Downside of this mod pack is that you need data editing knowledge to use so not recommended for newbie users. The Landsknecht/Doppelsoldner were mercenary soldiers formed by Maximilian I. at the end of the 15th century. Not only were these elite soldiers known for their strength in combat but also for their colourful and provocactive style of dressing. Usually armed with a double-hander broadsword or a long pike. Though the original civ3 unit contains only one beautifully adapted version of the Landsknecht/Doppelsoldner, the author adds two (!) more versions to it, all three versions included on the pack are very accurate and finely crafted. Top notch! The player colour was transfered from civ to age without any flaw, the unit size was adjusted to perfectly fit age! BUT moreover even the usual running animation of civ3 units has been changed into a walking animation that is perfectly fitting age units character. So why didn't I give the full 5 points? Just because of the fact that the author has not changed the angel count and erased the 3 angles (NE, E, SE). Surely one can edit the dat file or extract the slp file and cut out the 3 angles oneself.... but for a perfect 5 that should have been done by the uploader. Other than that: TOP NOTCH! 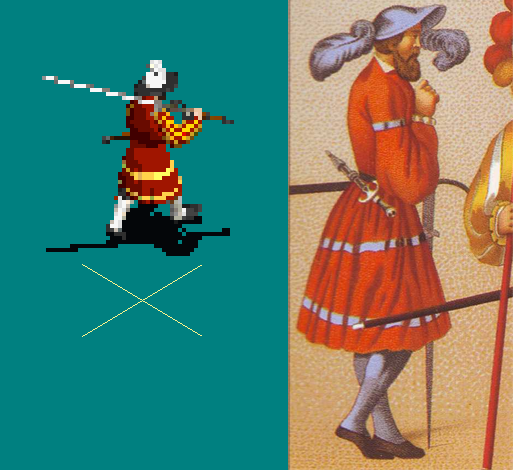 In the original Kinboat file there is another attacking animation (AttackB) in which the Landsknecht/Doppelsoldner is using the broadsword like a pike, which I personally liked. It would have been nice to have it with the unit probably better than the two very much a like looking attackings that the author provides. Thanks for reviews. It has been two years after I uploaded this unit. After read the comment I think there are something I should explain. First of all, this is not an unit graphic "converted" or "transfered" from Civ3. Kinboat made a 3D unit model of landsknecht in Poser, and he rendered it into Civ3 2D graphic format(.flc). An user(Churchill) in AOK heaven has coverted the Civ3 .flc files into AoE2 .slp format. But that is not what I did. I did't use Kinboat's .flc files, instead, I used the 3D Poser model made by Kinboat directly and render it into AoE2 slp format. That's why I can add more variations and make the size and colour of the unit is fit in AoE2 style. Unfortunately, although Kinboat kindly provided his Landsknecht Poser 3D model to public, he did not provide his model animations, that's why I can not reproduce the stabbing animation in Kinboat's Civ3 .flc Landsknecht graphic. About the unit graphic has 8 directions rather than 5, I did that deliberately because I think that would give the unit a higher graphical quality. Honestly speaking, I'm suprised that some people consider it as a flaw. BTW, there is a defect that the unit's legs are bending in a weird angle. I already fix that and may upload a new version in the future. Do you plan to make more units or is this a one and only unit.